GoPro has taken the wraps off their latest line action cameras —the Hero 7 Black, Silver, and White — with new smooth stabilization, 4K video at 60 FPS at the high-end, and live streaming support. All three of the new cameras keep the same familiar shape we've seen with past GoPros. As you move up the lineup, so does the price. Ranging from $199 to $399, increasing in $100 intervals. The specced out GoPro Hero 7 Black Edition is most impressive, being the only one to utilize the custom GP1 custom processor (that debuted with the Hero 6), sport a front facing screen, live stream, and more. Hero 7 Black is able to live stream footage using a phone's cellular connection to Facebook, Twitch, YouTube, and even Vimeo. A new "SuprtPhoto" mode works similarly to the new Smart HDR feature of the latest iPhones. There's also a new time-lapse video mode called "TimeWarp" as well. Looking at raw performance, the Hero 7 Black can shoot 4K at 60 FPS, 2.7K at 120 FPS, and 1080p at 240 FPS. It can also shoot RAW photos, up to 12-megapixels. There are built-in wind-noise filters and smile detection. The feature we are most excited to try out with the Hero 7 Black is the new stabilization. GoPro is able to tap a bit more into their custom silicon to do an even better job than in the past, with early reviews citing better performance versus older models. Turning to the more affordable Silver and White models, the Hero 7 Silver is still capable of shooting 4K at 30 FPS with 10 MP photos. The new Hero 7 White doesn't make it to 4K though, topping out at 1440p. Both the cheaper options have integrated batteries and lack the custom GP1 chip used in the Black. GoPro has had a rough couple years, laying off staff and dismantling their drone division, but this lastest lineup is the most promising yet. There are models at three different price points that should cater to both professionals, as well as hobbiests. 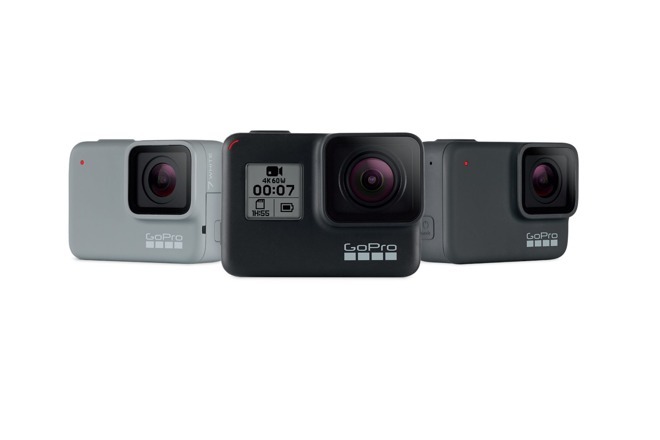 All three of GoPros will be available starting September 27th for $199, $299, and $399 for the White, Black, and Silver editions respectively.